Exiled Zimbabweans demonstrated outside the Zimbabwe Embassy in London on Saturday about the abduction of the human rights activist Itai Dzamara whose brave Harare protest ‘Occupy Africa Unity Square’ (OAUS) has made him a beacon of freedom. There are mounting fears that Itai has been killed by state security agents because he was seen being bundled into an unmarked truck by 5 unidentified men – typical CIO behaviour. At the suggestion of the writer Vince Musewe, Vigil supporters carried posters ‘I am Itai Dzamara’ to show solidarity with a man Musewe said had ‘a burning desire to do that which we must despite the personal cost’. Musewe asked: ‘Where are our pastors and our bishops? Where are our churches, civic organisations, human rights activists and our NGOs, our prophets and prophetesses, our community leaders, our opposition political party leaders and all those amongst us and in the Diaspora who claim that they stand for our freedom? Where are you all now because words alone will not do?’ For Musewe’s message see: http://nehandaradio.com/2015/03/13/i-am-itai-dzamara/. Among those at the Vigil was Tendai Kwari, leader of OAUS-UK, who said he feared for Itai’s life. He added that a citizen of Zimbabwe could not be allowed to just disappear. ‘We are all now living in fear’. Itai Dzamara has been arrested, assaulted and tortured several times during his protest which was launched last October when he called on Mugabe to step down. For a video showing the treatment that he might have received from the state, see: http://www.news24.com/Africa/Zimbabwe/Watch-Zimbabwe-police-brutality-20150313. Some people at the Vigil have experienced this brutality at first hand. A collection was taken at the Vigil for Itai Dzamara’s wife Sheffa, who says her young children haven’t stopped crying for their father to come home. Not troubled by Itai’s fate, Mugabe set off with about 100 hangers-on for an obscure UN conference in Japan on ‘Disaster Risk Reduction’, riding roughshod over objections from the Japanese Embassy in Harare at the bloated delegation (see: http://nehandaradio.com/2015/03/13/mugabe-and-japanese-embassy-clash-over-entourage-to-japan/). The Voice for Democracy group has appealed to EU countries to send observers to the by-elections on 27th March, which include Chiramanzu-Zibagwe where the wife of Vice-President Mnangagwa is standing as Zanu PF candidate against Jacob Ngarivhume of Transform Zimbabwe. Mr Ngarivhume says he fears intimidation and fraud being used yet again as an electoral tool (see: Voice of Democracy’s message to the Zimbabwe Election Commission on our campaigns page on this link: http://www.zimvigil.co.uk/vigil-news/campaign-news/669-voice-of-democracys-message-to-the-zimbabwe-election-commission-). Our friends from the Swaziland Vigil are meeting Vincent Ncongwane, Secretary General of the Trades Union Congress of Swaziland, on Wednesday 18th March in London. Swaziland is one of the last absolute monarchies in the world but opposition voices are growing louder and the government and monarchy are coming under growing pressure for democratic reform. Mr Ncongwane will speak of the role the Swazi Vigil UK can play in supporting the struggle. See ‘Events and Notices’ for meeting details. To see Vincent Ncongwane interviews: http://youtu.be/FTNlKuJPk0Q. For photos from Paul Davey of our protest on Mugabe’s 91st birthday, see: http://pauldaveycreative.photoshelter.com/gallery/2015-02-21-UK-Zimbabweans-mark-Mugabes-91st-birtday-with-embassy-protest/G0000HpfLNoDfHI0/. Thanks to Epiphania Phiri, Deborah Harry and Shylette Chipungura for selling snacks and drinks to fundraise for the Vigil. For latest Vigil pictures check: http://www.flickr.com/photos/zimbabwevigil/. Please note: Vigil photos can only be downloaded from our Flickr website. FOR THE RECORD: 59 signed the register. Swazi Vigil Meeting with Vincent Ncongwane. Wednesday 18th April from 6 – 8 pm. Venue: Strand Continental Hotel (first floor lounge), 143 Strand, London WC2R 1JA. Nearest station: Temple, next to Kings College London Mr Ncongwane is the Secretary General of the Trades Union Congress of Swaziland and will speak of the role the Swazi Vigil UK can play in supporting democratic reform. Next Swaziland Vigil. Saturday 21st March from 10 am to 1 pm outside the Swaziland High Commission, 20 Buckingham Gate, London SW1E 6LB. Zimbabwe Action Forum (ZAF). Saturday 21st March from 6.15 pm. Venue: Strand Continental Hotel (first floor lounge), 143 Strand, London WC2R 1JA. From the Vigil it’s about a 10 minute walk, in the direction away from Trafalgar Square. The Strand Continental is situated on the south side of the Strand between Somerset House and the turn off onto Waterloo Bridge. The entrance is marked by a sign at street level. It's between a newsagent and Pizza Express. Nearest underground: Temple (District and Circle lines) and Holborn. The Rise and Shine of Comrade Fiasco, a play by Zimbabwean writer Andrew Whaley showing at the Gate Theatre, 11 Pembridge Road, London W11 3HQ, until 21st March. For more information and to book, check: http://www.gatetheatre.co.uk/events/all-productions/the_rise_and_shine_of_comrade_fiasco. Democrats. Two showings of this film about the constitution-making process in Zimbabwe in London on 20th March at 6.30 pm at the Barbican and 23rd March at 6.15 pm at the Ritzy, Brixton. Check: http://ff.hrw.org/film/democrats?city=4 for tickets. Both screenings are followed by discussion with filmmaker Camilla Nielsson and Dewa Mavhinga, Senior Researcher for Zimbabwe and Southern Africa, Africa Division, Human Rights Watch). Zimbabwe Yes We Can meeting. Saturday 28th March at 12 noon. Venue: The Theodore Bullfrog, 26-30 John Adam Street, London WC2N 6HL. Zimbabwe Yes We Can Movement holds monthly meetings in London as the political face of ROHR and the Vigil. Zimbabwe Vigil Highlights 2014 can be viewed on this link: http://www.zimvigil.co.uk/vigil-news/campaign-news/642-zimbabwe-vigil-highlights-2014. Links to previous years’ highlights are listed on 2014 Highlights page. SW Radio Africa’s website and sound archive is being hosted on www.archive.org. Go to the site and type in swradioafrica which will link you to snapshots of their site over the years and at the top of that page a link to their website where, under podcasts, you will find the audio. Strong support for the Vigil’s criticism of the European Union’s new policy of ‘re-engaging’ with the Mugabe regime has come from a former senior American official. ‘To appease a brutal dictator and his henchmen is to wind up on the wrong side of history’, warns the former Deputy Assistant Secretary of State for African Affairs, Todd Moss (see: http://foreignpolicy.com/2015/03/03/mugabes-new-best-friends-in-brussels/). Mr Moss’s article appears in ‘Foreign Policy’ magazine with the sub title ‘Why is Europe suddenly cozying up to Zimbabwe’s nonagenarian kleptocrat’? He says Mugabe’s lavish birthday celebration ‘was yet another reminder of the stark contrast between the increasingly venal lifestyles of the country’s politically-connected nouveau riche and regular Zimbabweans, who are now poorer than they were when Mugabe came to power nearly 35 years ago’. Mr Moss concludes that ‘the ethical and strategic move is to keep Mugabe and his birthday party guests at arm’s length’. A different view is taken by Dr Tapiwa Shumba, former spokesperson for the MDC in South Africa, who says opposition parties must realise that Zanu PF and Mugabe are in power and stop being confrontational. ‘It is because of this confrontational strategy that the opposition must also partly take responsibility for the obvious polarisation in the country’, say Dr Shumba who has taken a one year sabbatical we presume to work out how the opposition can help run the gas chambers in Zimbabwe more economically. ‘Opposition with co-operation’ as he put it (see: http://nehandaradio.com/2015/03/05/zimbabwe-opposition-must-change-from-confrontation-to-cooperation-shumba/). Whatever the differences of opinion over re-engaging Mugabe, no one can deny the rampant corruption in Zimbabwe. But despite this, Britain’s Department for International Development (DFID) continues to pour money into Zimbabwe which we have long argued serves to prop up the regime. The author Jonathan Foreman says DFID is willfully naïve. ‘The reason is that DFID staff, like so many people in Big Aid, are wearing ideological blinkers. They have to keep on giving money to governments that are ravaging their own societies, and they have to pretend that local officials are akin to our own, rather than bandits and exploiters. Otherwise they would have to surrender their core conviction that “fragile” (i.e. chaotic, corrupt, impoverished and dysfunctional) states are that way not through the fault of their own governments and elites, but only because of a lack of money, resources or technology, and/or because evil foreigners have wrecked them . . . It’s why the UK’s bloated aid effort will continue to be wasteful, inefficient and a kick in the teeth for the British taxpayer’ (see: http://www.breitbart.com/london/2015/02/13/britains-bloated-wasteful-foreign-aid-programme-is-next-to-useless/ –Incompetent British Aid Agency Overwhelmed By Too Much Money). The Zimbabwe Peace Project complained only this week that children of MDC members in Bindura South are being denied access to educational assistance under the Basic Education Assistance Module (BEAM). The British taxpayer has been the main sponsor of this project (see: http://www.zimbabwesituation.com/news/zimsit_w_opposition-party-members-children-denied-access-to-educational-assistance-zpp-newsday-zimbabwe/). British diplomats could take the matter up with the Zimbabwe Anti-Corruption Commission, but its Chief Executive Ngonidzashe Gumbo has just been jailed for – you guessed it – corruption (see: http://www.herald.co.zw/anti-corruption-commission-boss-jailed/). Not surprisingly, Mr Gumbo is a former Senior Assistant Commissioner of Police. · We had a chaotic start to the Vigil because all traffic was disrupted by a big demonstration over climate change. A police van was parked in the middle of our space. · On a lovely sunny day (at the request of Enniah Dube, Vice-Chair of ROHR) we marked International Women’s Day in support of Women of Zimbabwe Arise (WOZA) who were beaten by police during a Valentine’s Day protest in Bulawayo (see report from Amnesty International on our campaigns page: http://www.zimvigil.co.uk/vigil-news/campaign-news/665-zimbabwe-update-from-amnesty-international-uk-woza-action-march-2015-). · A meeting of the Zimbabwe Action Forum after the Vigil heard a preliminary report of a working committee set up to formulate a charter for the Zimbabwean diaspora. · Thanks to a regular supporter who brought a number of Zimbabwean caps for us to sell in support of our activities. · The Vigil has protested to the British Home Secretary Theresa May at an asylum judge’s ill-informed criticism of us. You can see the letter on our campaigns page: http://www.zimvigil.co.uk/vigil-news/campaign-news/666-a-discredited-judge--letter-to-the-uk-home-secretary). · Thanks to Deborah Harry, Epiphania Phiri and Hilda Gwesele who sold drinks and snacks to fundraise at the Vigil. Thanks also the Eunice Mucherechedzo and Helen Rukambiro for taking care of the front table. FOR THE RECORD: 54 signed the register but there were many more at the protest. ROHR Southampton branch meeting and outreach. Saturday 14th March 11 am – 3 pm. Venue: Eastleigh Library, 1st Floor, Swan Centre, Eastleigh SO50 5SF. Special guests Councillor Wayne Irish and NHS Practitioner Sunitha Rajeev. For further enquiries please contact: Sally Mutseyami (Chairperson) on 07448730581. ROHR Slough general meeting. Saturday 14th March from 11 am – 2 pm Venue: Upton Lea Community Hall, Slough. For more information contact: Fungisai Mupandira (Organising secretary ) 07758958803, (Chairperson )Patricia Masamba 07708116625, (Vice chairperson ) Nkosi Tshabangu 07926 977 646. The Rise and Shine of Comrade Fiasco, a play by Zimbabwean writer Andrew Whaley showing at the Gate Theatre, 11 Pembridge Road, London W11 3HQ, until 21st March. The theatre has given the Vigil flyers with a promo code for discounted tickets of £5 until 14th March. These can be picked up from the Vigil. Check: http://www.gatetheatre.co.uk/events/all-productions/the_rise_and_shine_of_comrade_fiasco for more information and to book. Zimbabwe Action Forum (ZAF). Saturday 21st March from 6.15 pm. From the Vigil it’s about a 10 minute walk, in the direction away from Trafalgar Square. The Strand Continental is situated on the south side of the Strand between Somerset House and the turn off onto Waterloo Bridge. The entrance is marked by a sign at street level. It's between a newsagent and Pizza Express. Nearest underground: Temple (District and Circle lines) and Holborn. ‘An event of truly spectacular moral ugliness’ was how the Mayor of London Boris Johnson described Mugabe’s 91st birthday party. Johnson’s opinion counts as he has a strong following and is widely tipped to be a future Prime Minister. Happy-birthday-Mr-Mugabe-with-special-love-from-Labour.html – Happy birthday, Mr Mugabe, with special love from Labour). The Mayor of London doesn’t have to look far to find ‘brainwashed Zimbabweans’. The Zanu - PF UK Chairman, Nick Mangwana, told a birthday celebration in Birmingham that Mugabe was ‘a visionary who does not get old but instead gets better . . . It is the gift to see what nobody else can see’. Things like food on the table, clean tap water, electricity, jobs? (see: http://www.mafaro.co.uk/2015/02/pics-mugabes-uk-birthday-bash.html?m=1 – Mugabe's UK Birthday Bash). Avoiding-a-full-tummy-is-the-secret-to-long-life-reveals-Zimbabwes-President-Robert-Mugabe.html) - Avoiding a full tummy is the secret to long life,' reveals Zimbabwe's President Robert Mugabe). The economist Vice Musuwe sees things differently. In a letter to the diaspora he said walking the streets of Harare it is difficult not see and smell the poverty and hopelessness. Living standards have gone back 60 years and we should expect nothing new in 2015 except lies that things are getting better (see: A letter to the Diaspora – http://www.zimbabwesituation.com/news/zimsit_w_a-letter-to-the-diaspora/). · Thanks to Fungayi Mabhunu for donning our Mugabe mask to illustrate the ‘nauseating feast; at Victoria Falls. · Insights into our rulers: former Reserve Bank Governor Gideon Gono is disputing a claim for $1.3 million for cars he bought for his various business enterprises in January 2009. He doesn’t contest the debt but argues it was an illegal transaction as it shouldn’t have been done in US dollars at the time! Just another of his dodgy deals then? (see: $1,3m debt haunts Gono – http://www.zimbabwesituation.com/news/zimsit_w_13m-debt-haunts-gono-the-herald/). · Vice President Mnangagwa says the government is ‘realigning’ the indigenisation policy to attract foreign investment. But new indigenisation minister Chris Mushohwe say he is still trying to find out what he is supposed to be doing in his job . . . (see: http://www.zimbabwesituation.com/news/zimsit-m-govt-to-revisit-indigenisation-mnangagwa-the-zimbabwe-independent/ - Govt to revisit indigenisation: Mnangagwa). · For Makusha Mugabe’s article on our big protest on Saturday 21st February see: http://www.changezimbabwe.com/index.php/news-mainmenu-2/1-latest/5252-time-to-u-nite-and-send-robert-mugabe-packing. · There are two further showings in London of the film ‘Democrats’: 20th March at 6.30 pm at the Barbican and 23rd March at 6.15 pm at the Ritzy, Brixton. Check: http://ff.hrw.org/film/democrats?city=4 for tickets. Both screenings are followed by discussion with filmmaker Camilla Nielsson and Dewa Mavhinga, Senior Researcher for Zimbabwe and Southern Africa, Africa Division, Human Rights Watch). FOR THE RECORD: 31 signed the register. · ROHR Executive Meeting: Saturday 7th March at 12 noon. Venue: Strand Continental Hotel (first floor lounge), 143 Strand, London WC2R 1JA. For directions see below. · Zimbabwe Action Forum (ZAF). Saturday 7th March from 6.15 pm. From the Vigil it’s about a 10 minute walk, in the direction away from Trafalgar Square. The Strand Continental is situated on the south side of the Strand between Somerset House and the turn off onto Waterloo Bridge. The entrance is marked by a sign at street level. It's between a newsagent and Pizza Express. Nearest underground: Temple (District and Circle lines) and Holborn. · Zimbabwe Action Forum (ZAF) meets regularly after the Vigil to discuss ways to help those back in Zimbabwe to fight oppression and achieve true democracy. · Next Swaziland Vigil. Saturday 7th March from 10 am to 1 pm outside the Swaziland High Commission, 20 Buckingham Gate, London SW1E 6LB. · ROHR Southampton branch meeting and outreach. Saturday 14th March 11 am – 3 pm. Venue: Eastleigh Library, 1st Floor, Swan Centre, Eastleigh SO50 5SF. Special guests Councillor Wayne Irish and NHS Practitioner Sunitha Rajeev. For further enquiries please contact: Sally Mutseyami (Chairperson) on 07448730581. · The Rise and Shine of Comrade Fiasco, a play by Zimbabwean writer Andrew Whaley showing at the Gate Theatre, 11 Pembridge Road, London W11 3HQ from 26th February to 21st March. The theatre has given the Vigil flyers with a promo code for discounted tickets of £5 until 14th March. These can be picked up from the Vigil. Check: http://www.gatetheatre.co.uk/events/all-productions/the_rise_and_shine_of_comrade_fiasco for more information and to book. · Zimbabwe Yes We Can meeting. Saturday 28th March at 12 noon. Venue: The Theodore Bullfrog, 26-30 John Adam Street, London WC2N 6HL. 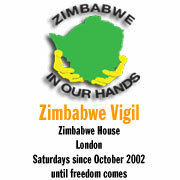 · Zimbabwe Yes We Can Movement holds monthly meetings in London as the political face of ROHR and the Vigil. · The Restoration of Human Rights in Zimbabwe (ROHR) is the Vigil’s partner organization based in Zimbabwe. ROHR grew out of the need for the Vigil to have an organization on the ground in Zimbabwe which reflected the Vigil’s mission statement in a practical way. ROHR in the UK actively fundraises through membership subscriptions, events, sales etc to support the activities of ROHR in Zimbabwe. Please note that the official website of ROHR Zimbabwe is http://www.rohrzimbabwe.org/. Any other website claiming to be the official website of ROHR in no way represents us. · Zimbabwe Vigil Highlights 2014 can be viewed on this link: http://www.zimvigil.co.uk/vigil-news/campaign-news/642-zimbabwe-vigil-highlights-2014. Links to previous years’ highlights are listed on 2014 Highlights page. · SW Radio Africa’s website and sound archive is being hosted on www.archive.org. Go to the site and type in swradioafrica which will link you to snapshots of their site over the years and at the top of that page a link to their website where, under podcasts, you will find the audio.